Using a computer/laptop in your everyday life is an important part of your personal or professional work. You keep all your important data in your computer/laptop. So it’s obvious that if you forgot your login password of your computer/laptop, it gives a good amount of headache. Many users don’t know how to unlock a computer. So “how can I unlock my computer?” is a common question on the internet now. If you are reading this article, then you will easily learn to unlock a locked computer password in no time. There are some steps and guidelines that you need to follow in order to unlock a laptop/computer. If you are locked out of computer, just read this article and choose any method that’s suitable for you, without worrying too much. 1. First you need to start a browser in an accessible computer/laptop and visit this link to go to the next step. 2. Next click on the “I Forgot My Password” button and then click on “Next”. 3. One the next page, provide the email or phone number that you have used to sign up in your Microsoft account. 4. Then you will get two options from Microsoft – Email or phone number, to receive a code. 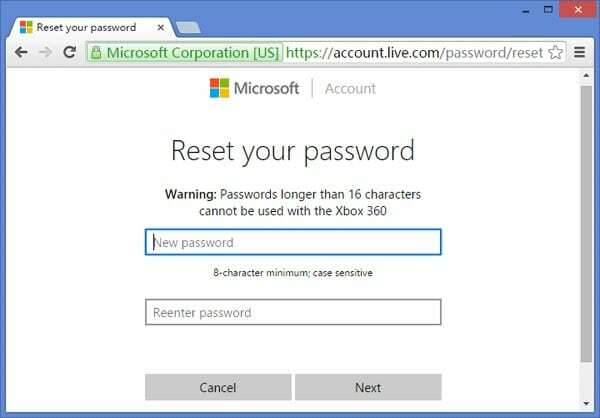 You will have to provide that one time code to verify and successfully reset your Microsoft account password. 5. After you receive the code on your phone, enter the code on the Microsoft account page that you are on and choose a new password for your Microsoft account. You must remember the password so you can also write it down somewhere safe. 6.Finally, you can turn on your computer/laptop and use the new password to login. It can recover forgotten password for all Windows in a few minutes. It can create a new administrator account easily without logon. It can create USB flash drive disk or CD/DVD Disc. Support Windows 10, 8.1, 8, 7, Vista, XP, 2000, NT. Support Windows Server 2016, 2012, 2008(R2), 2003(R2), 2000, NT. 1. Download, install and start the software on a computer/laptop and insert an empty USB drive on that computer. From the first interface of the software, click on the “USB device” option and choose that USB drive from the drop down list that you will get in your computer/laptop screen. 2. 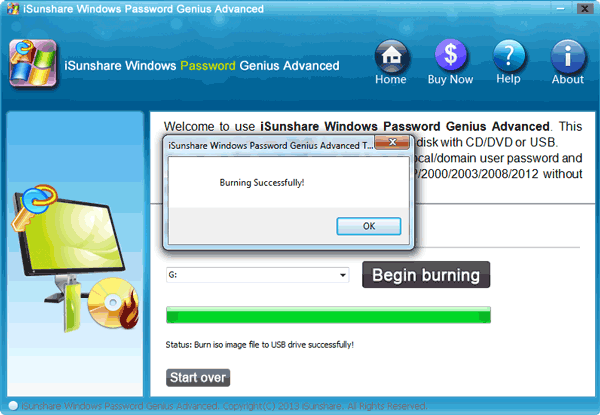 Next click on “Begin burning” to burn the password resetting drive. It will take almost 1 minute time. 3.Click on the “OK” button and finish the process. 4.For the next procedure, insert the bootable USB flash drive in your locked computer/laptop. Then restart it and enter the boot menu by pressing the “F12” or “ESC” button. 5.Choose the USB drive as your boot device and press the “Enter”. 6.The main interface of the software will come up in your computer/laptop screen. 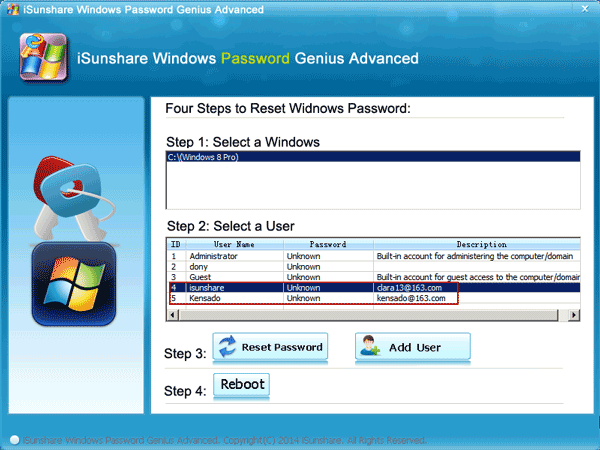 7.Choose the Windows system and then the user account that you need to reset the password from. Then click on “Reset Password”. 8.Finally, click on “Reboot” button to restart your computer/laptop. You will be able to log into your computer/laptop without any password from now on. 1. First you need to create a bootable disk by using another computer/laptop and insert that disk into your locked computer. Next you need to boot up your locked computer. The software will load after the booting process is finished. When you see the word “Boot” on your computer/laptop screen and you need to press the “Enter” button after that. 2. The software will detect all the disk partitions or drives that are available in your computer/laptop and you need to choose the one that contains your Windows installation files. 3. Next leave the default choice as it is and press the “Enter” button. This actually means that you are choosing which part of the registry you want the software to load and also selecting the edit option for user data and passwords. Now type in your username and press “Enter”. 4. Choose the default user account that you want to delete the password from and press “Enter” Key. 5. The password will be deleted automatically but you have to exit the process now. Press “!” and “Enter” key, then press “q” and “Enter” key again. 6. Confirm the changes that you have made. You need to press “y” and then press “Enter” key. Again press the “Enter” button to confirm that no further actions are required. Remove the CD/DVD/Drive and restart your computer/laptop. 7. You can now login to your computer/laptop without any password. Reading this article will help you to learn the best 3 methods to unlock a locked computer. There is no need to panic if you got locked out of computer/laptop or you don’t know anything about computer/laptop password unlocking. You can follow any method from here that suits your need but the best one is by using a computer password unlocker. 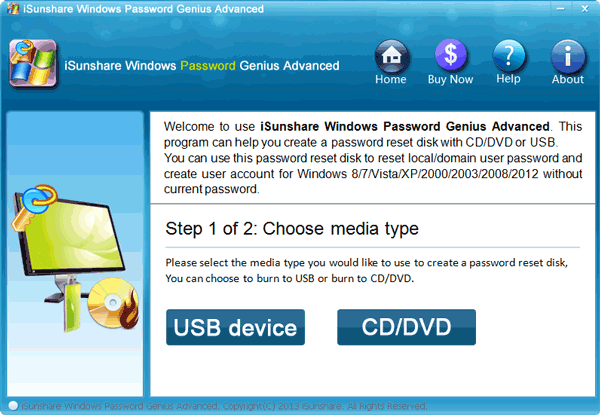 So without wasting your time on any other methods, just use Windows Password Recovery Tool to get the best result.